Seattle Center, created for the 1962 World’s Fair, is also home to The Space Needle, The Seattle Monorail, The International Fountain, Experience Music Project (EMP), and the Pacific Science Center. All of these attractions are popular with children and teens. Even if you don't go up in the Space Needle, gather your group on the ground and get a photo looking up with the Space Needle in the background. Northwest Folklife Festival If you are visiting Seattle following our Fort Worden Children's Choir Festival, be sure to add this festival to your itinerary. Held at Seattle Center each Memorial Day weekend, this annual event celebrates music, dance, stories, art and food of the people of the Pacific Northwest. Festivalgoers have the opportunity to participate in the many traditions of our diverse region. You will see live performances, visual arts and hands-on activities. There are over 7,000 performers each year. Plan to spend at least a few hours here. Lunch works best in small groups so that singers can select from the many different booths offering foods from around the world! Pike Place Market This historic landmark is at the top of our list of places to visit in the Seattle area. You will see many local craftsmen, artists, food growers, performers and more! The market is also home to the very first (original) Starbucks coffee shop. Admission is free. Bring souvenir or lunch money if planning to shop/eat. Seattle Waterfront See circling seagulls charming the crowd and smell aromas of freshly baked waffle cones and steaming baskets of fish & chips. Browse the eclectic souvenir and curio shops such as Ye Olde Curiosity Shop and consider having a group dinner at The Old Spaghetti Factory (always a good choice for children’s and youth choirs – and good for the tour budget!). You will also see and may want to ride the Great Wheel, Seattle's newest waterfront attraction. Standing 175 feet tall, it is the largest observation wheel on the West Coast. The Wheel has 42 fully enclosed gondolas, each seating up to 8 people. The wheel extends nearly 40 feet beyond the end of the pier, over Elliot Bay. Seattle Aquarium Also on the waterfront and walking distance from Pike Place/Spaghetti Factory. Some choirs even give a short performance here prior to enjoying the exhibits. Call the aquarium directly to arrange. Washington State Ferries The largest ferry system in the United States and an unbeatable view while on board! If you ride the Seattle/Bremerton ferry you will find the best view of the city from the water. Great for photos on a clear day. Seattle Underground Tour Go underground Seattle through a network of passageways that once were the main roadways and first-floor storefronts of old downtown Seattle - the original ground level of the city as it was in the mid-19th century. After the streets were elevated these spaces fell into disuse, but have become a popular tourist attraction. The tour begins inside Doc Maynard's Public House - a restored 1890's saloon. Following a short intro, your amusing tour guide will take you on this leisurely walking tour through three blocks of historic Pioneer Square. Tour lasts about 90 minutes. You will hear stories and historical facts, learning about everything from the Great Seattle Fire to the architecture and structures of the buildings and the invention of the flushing toilet. Admission: $9-17. Group rates avaialble. Ride The Ducks A quirky and unusual way to see the city! Your hilarious captain will take you on a fun adventure tour by land and sea in these amphibious World War II vehicles that are unusual boats with wheels. Ballard Locks See the boat elevators and fish jumping up the under water ladder. One of Seattle's most popular tourist attractions. The Locks link Puget Sound to Lake Union and Lake Washington. Fremont Troll A simple, but unusual photo opportunity with our local troll under the bridge! This gigantic, life-size public sculpture is located in the Fremont neighborhood of Seattle. Museum of Flight - One of the largest air and space museums in the world, this museum's collection includes over 150 historically significant air and spacecraft, as well as the Red Barn - the original manufacturing facility of The Boeing Company, the original papers of the Wright brothers, and the one-of-a-kind NASA Space Shuttle Trainer, used to train every space shuttle astronaut since the inception of the program. Among the most popular exhibits at the museum are the world's first fighter plane, the first jet Air Force One, the prototype Boeing 747, the West Coast's only Concorde, and the world's fastest aircraft - the Blackbird spy plane. Admission: $9 for Youth Groups. Theo Chocolate Factory Tour - This organic, fair-trade, local chocolate company offers 1-hour tours for $7 per person. Close-toed shoes are required as it is a working factory. On factory tours, they will entertain you with the story of cocoa, including the extraordinary transformation of the cocoa fruit into what we know and love as chocolate, as well as the social and environmental issues relating to cocoa and cocoa farmers. Best of all, you’ll get to try their amazing products! Woodland Park Zoo - This award winning zoo features over 1000 animals including 35 endangered species. You can visit numerous exhibits including Tropical Rain Forest with walkways leading through the different layers of the rainforest and homes for jaguars, monkeys, toucans and frogs and Tropical Asia which includes Elephant Forest complete with a full-depth swimming pool for three female elephants. There are giraffes, over 100 parrots, kookaburras and snow leopards. You can also visit the Sumatran Tigers, Raptor Center and Japanese Serows. There is also a hand-carved carousel, originally built for the Cincinnati Zoo in 1918. Admission: $11-18. Group discounts available. Halfway between Tacoma and Seattle you'll find our local Wild Waves water park. Open 10AM-6PM on weekends in June. Wild Waves is the largest combination water park AND theme park in the Pacific Northwest featuring over 60 rides, slides and attractions including 3 roller coasters, a 24,000 square foot wave pool, a relaxing lazy river and over 1,000,000 gallons of fun for people of all ages! Point Defiance Park - this 702 acre park is a popular destination for more than 3 million people each year. Entrance is free to enjoy picnic areas, natural forest, saltwater beaches and spectacular views offer numerous possibilities for recreation, education and communing with nature. 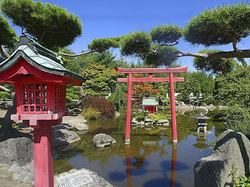 Beautiful thematic gardens, including a Japanese Garden, Rose Garden and Northwest Native Garden provide a wide variety of horticultural experiences for visitors. Go-Karts & Batting Cages are located to the right of the entrance to Point Defiance Park. Owen Beach offers a relaxing place to hang out and enjoy a picnic on a sunny day - waterfront picnic shelters, restrooms, grills, tables, views of Vashon Island, ferry boats and fishing craft. While at Point Defiance Park, visit the Fort Nisqually Living History Museum to experience life in Washington Territory during the fur trade era. Volunteers and staff dress in period clothing and demonstrate the crafts of the 19th century. Fort Nisqually was the first European settlement on Puget Sound. Admission to the museum is $4-7. Point Defiance Zoo & Aquarium - exhibits reflect the zoo's theme of ecosystems from the Pacific rim: Asian Forest Sanctuary with tigers, elephants and the clouded leopard. Rocky Shores which is home to harbor seals, walruses, sea otters and puffins. Arctic Tundra featuring muskoxen and reindeer, polar bears and foxes. The Aquariums featuring species from different parts of the Pacific Ocean. Red Wolf Woods. Kids Zone featuring a petting zoo, play structures and additional exhibits. There is an outdoor animal theater with daily shows and a carousel you can purchase tickets for. Tickets: $11-13 if purchased ahead of time. There are also two exciting zipline courses available for an additional fee. Museum of Glass - Admission: $5-12. Exhibits, live glassmaking in the world's largest hot shop and an education studio. Check website for schedule and more information. Tacoma Narrows Bridge - a pair of twin suspension bridges spanning the Tacoma Narrows strait of Puget Sound, connecting Tacoma to the Kitsap Peninsula. When constructed in 1938, the original bridge was the third longest suspension bridge in the world in terms of main span length, behind the Golden Gate Bridge and the George Washington Bridge. From the time the deck was built, it began to move vertically in windy conditions, leading to the construction workers giving it the nickname, "Galloping Gertie". The original bridge dramatically collapsed under 40MPH winds in 1940. 10 years later a new bridge was constructed, which still stands today. A second bridge was built, opening in 2007. Spanaway Park (closest park to PLU/Youth Choir Festival) - this 135 acre park along beautiful Spanaway Lake is popular with year-round activities. There are two swimming beaches (no lifeguards), a fishing pier, bathrooms, picnic areas, playground and waterfront walking trails. Canoes and paddle boats are available from the boathouse. Park hours: 7:30 AM to dusk. Open to the public - no fee. Northwest Trek Wildlife Park (30 minute drive from Tacoma) - A narrated tram tour allows you to see bison, Roosevelt elk, moose, mountain goats and other native animals up close in the natural habitats. A self-guided walking tour along paved trails in the core of the park provides the opportunity to see grizzly bears, wolves and more in naturalistic exhibits. The park is an easy drive from Tacoma and Seattle. It is open year-round. Admission: $11-16. Group rates available.